According to experts, a low-carb diet may boost your chances of getting pregnant. Yes, we're as discouraged by this as you are. If you're struggling to get pregnant, you may want to step away from the pizza. And bagels. And pasta. Why, you ask? Because, according to fertility experts, a low-carb diet may increase your odds of conceiving. According to doctors who presented at the European Society of Human Reproduction and Embryology's 2017 annual meeting in Geneva, sticking to just one portion of carbs a day could significantly improve your odds of conceiving. They explained that a high-carb diet may damage sperm cells or even affect a woman's egg quality. The experts even believe that a high-carb diet may make a woman's womb less receptive to implantation. Experts are basing their advice in part on a 2013 research study at the Delaware Institute for Reproductive Medicine which studied 120 women undergoing fertility treatment. The women who consumed a diet of less than 40 percent carbohydrates had a pregnancy rate almost double that of the women with a higher carbohydrate intake. Does that mean you have to kiss bread goodbye if you're TTC? Not necessarily, but it may be wise to limit your carb intake. 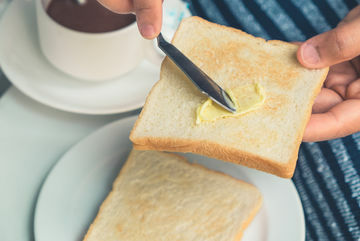 "I tell my patients that if they are going to have toast for breakfast, then that is their carbs for the day. They cannot then have a sandwich for lunch and pasta for dinner," Gillian Lockwood, M.D., said at the meeting, according to Daily Mail. Instead, Dr. Lockwood, who practices at the Midland Fertility Clinic in Staffordshire, England, suggests that her patients eat a diet filled with unlimited leafy greens and lean protein. And if you're the kind of woman who can eat any number of cookies without gaining weight, well, here's where your luck runs out: The researchers also reportedly made it clear that women of all weights may experience this effect. Let's just say it: This news is sort of a bummer. Women who are trying to get pregnant have so much to think about already, and this is just one more lifestyle change you may have to consider if you're seriously trying to conceive. Just add it to the ever-growing list of the forbidden that already includes alcohol, excess caffeine and sushi. On the other hand, this news shouldn't come as a huge surprise: As we've previously reported, experts stand by the effectiveness of The Fertility Diet. There's also plenty of evidence to support the idea that when it comes to getting your body ready for baby, what you put into your mouth matters. Our take on all this? There's a healthy balance you need to strike when you're hoping to get pregnant, and while findings like this are important to consider, it's really more about living the healthiest lifestyle you can before and during pregnancy. That means getting your veggies and protein and, when it comes to the delicious carb-y things, practicing moderation. Easier said than done, we know!